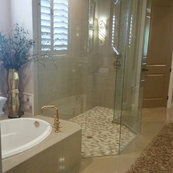 We have been working with International Tile & Stone for about 10 years. They are extremely responsive, efficient, & have beautiful product. Their showroom is absolutely fantastic & offers an unlimited amount of ideas for tile & stone. We highly recommend them & look forward to many more years of a great business relationship!